I miss having a Noisering and once I've finished this oscillator twiddling my thumbs will get boring pretty fast. The Sine/Cosine on the New New Controller goes further than than the Malekko Oscillator for modulation. As for audio rate, personally I would love to have something like an E350 but fully analogue with a nice sine to FM it with. As for the Anti-Envelope, that's kind of the child of the Sequantizer. All IMO and not in any way related to fully normalised and officially sanctioned Wiard company policy. I recently realized that the "Random" output on the Classic VCO makes for a more interesting replacement for the NoiseRing than I thought. Exponential FM obviously translates to "External Rate" on the NR, the Synch input provides for the clock input that the 1200 series NR never had (contrary to the Malekko version) and more than that actually, and finally the pitch-stable linear FM input provides for something I'd call "density" change for lack of more scientific insight. It's not the same, and may not give the same instant gratification as the NR/ requires a bit more thinking to get to that level of versatility, but I have a feeling that once I get used to that, it'll be at least as interesting and fun. It's amazing how deep the Wiard 300 really is. -- Speaking of linear FM tho, I find that all VCAs in my system (VCOs' onboard VCAs, Envelator crossfader, Mixolator) introduce enough DC offset into their outputs to effectively disarm the AC coupling of the VCOs' Linear FM inputs, i.e. I can't seem to get really pitch stable FM with medium to large modulation indeces and with medium to fast envelopes on the indeces. Even the Mixolator slightly dissapoints in this regard, since an early Wiard customer said it was the most "thump"-free VCA that he knew. So, anyone know if some offset & pitch bump while approaching unity gain is common or varies from module to module? Not saying that I didn't like FM on the Wiard BTW, it sounds lovely; just a bit less usable for some melodic purposes than I thought. Haven't tried using the Borgs and Boogie as FM attenuators yet. The VCAs in those modules are CA3080A I believe, which requires individual trimming of offset on the inputs per module, something that was omitted for cost/space. I don't think it's high for the VCAs, but enough to add a few errant mV. I personally only found it noticeable under heavy dynamic depth FM, where the AC coupling is useless as the offset is modulated and is no longer DC. One thing that has also occurred to me recently, is that the method which which you force a triangle into a square at the core of a triangle VCO, is generally slightly assymetrical, which is the case with the zener diode clamping in the Classic VCO core. This can't be corrected by AC coupling and will also yield a slight perceived pitch offset under extreme FM conditions. Circuit design is very much a constant trade off in terms of cost, accuracy, sound character, there is rarely such a thing as a "perfect" design. Incidentally, for my oscillator design, I've realised that 4 quadrant multipliers, which I am using for transconductance , are inherently capable of "through zero" modulation without any additional circuitry. Funny, I had a similar thought recently - if I put a DC source into a Mixolator X or Y channel, put my FM modulator into Z, turn the Z pot to the center mix position (at about 14:30), switch to ring modulation - doesn't applying that output to an FM input result in through zero FM? Anyway, do you think offset trimming could be added to the Classic VCO board (in either the CVCO or the WFC) without problems? It's not only noticeable in FM but also waveshaping; although as you said, it's a tradeoff and I like the WFCs having individual character. No unfortunately it won't (I don't think, although it can't hurt to try! 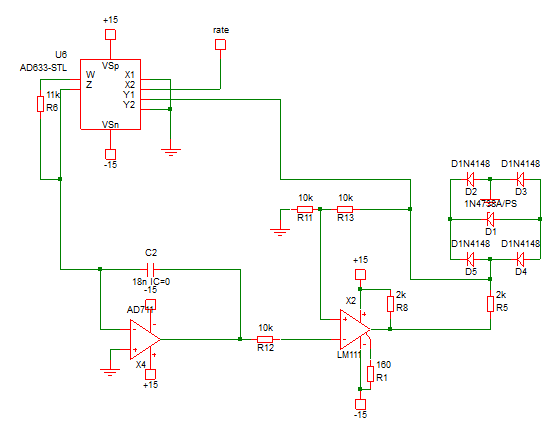 ), the polarity switch needs to be done right at the VCO core. TZ oscillators effectively find a way to "force" 4 quadrant behaviour from a 2 quadrant transconductance multiplier, but if you are using 4QMs then you are good to go. You would need to cut one or more traces on the PCB, and generally cause some messiness. It is also not possible to make the carrier oscillator absolutely symmetrical about 0V without a redesign of the oscillator itself, which personally I think will also influence perceived centre frequency when it is under heavy FM. It's not just the VCA unfortunately. Here's an old experiment to illustrate what I'm talking about drumsofdoom. That's a triangle core where the triangle periodicity is controlled by the comparator immediately after it whose value is high positive or high negative. A comparator is effectively an amplifier with infinite gain and therefore a square which controls the direction of the current going in and out of the main timing capacitor (in this case using the AD633 multiplier). However, infinite gain is not controllable so how do you set symmetrical limits of say, exactly +/-5V for the square? This method uses a zener diode to clamp the top of the square, but a zener is temperature dependent, and there are a few other areas for inaccuracies as well with this method. Thanks for the details! But yes, when I just insert another VCO's output into the Classic VCO's "Lin" jack directly and tweak the attenuator, pitch is stable no matter how far and fast I turn. Pitch drift does seem to be a VCA issue. Not a big one though, I might eventually augment with some VCA in Frac and until then the Wiard's got plenty of other ways for timbre modulation.